Accountability For People: Knock Knock. Who's there? 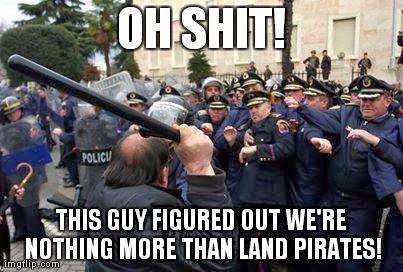 Land Pirate. Land Pirate who? The police ma'am. Knock Knock. Who's there? Land Pirate. Land Pirate who? The police ma'am. Legality is the shelter for swindlers and thieves they make for themselves by passing statutes and acts. It is NOT law unless you consent to it. "It's only on the brink that people find the will to change. Only at the precipice, do we evolve." Freedom links to other sites and web pages. "WE ARE GOVERNED ONLY BY OUR CONSENT"
Why You NEVER Call The Police For ANYTHING! A good idea for everyone to do on their own. "When you have made evil the means of survival"
Raising The Bar On EVERYTHING! Do You Know Why I Pulled You Over? Understanding the nature of the public debt. But Who Would Build The Roads? Uncle Sam, Full Of Green PORK! It takes them more than 8 hrs to pic their nose. Would you save a cop from a burning building? How They (gov officials) See You. "If I Could Tell the World Just 3 Things"
Why the cops don't want you to have guns. What if eveyone just ignored the idiots? Validation Of Federal Jurisdiction. Or NOT! The law of their own ignorance. Community Watch Area. Police NOT Welcome! Eddie Craig Teaches How To Talk to a Police Officer during a Traffic Stop. If you get pulled over by a cop, police officer, law enforcement officer, pirate, highwayman, or whatever you choose to call them, you will need to know what to say during the traffic stop in order to fight the traffic ticket in court. Learn your rights before you end up in a court. Click the pic for the broadcast. Rather than posting video's about citizens complaining about the problems everyone is upset about, I'm posting videos of People who have real solutions and answers to those problems. Ray cox is one of those People. One learns by doing, and Ray has been living it for decades now. Click the pic for the broadcast. Brilliant demonstration by Larken Rose. One cannot change reality by changing the words you use to describe reality. Look beneath the rhetoric, and glimpse the truth. Actio non datur non damnificato - An action is not given to one who is not injured. NOTE: Statutory acts ask for compensation when there is no injured party. This is theft by coercion under duress. Actori incumbit onus probandi - The burden of proof lies on the plaintiff. NOTE: The Officer is the complaining party. The court presumes to represent the People, but there is a direct conflict of interest. They both represent the State / municipality Incorporated / corporation for whom they draw their paychecks. This is NOT justice. This is just-us! Argumentum ab auctoritate fortissimum est in lege - An argument drawn from authority is the strongest in law. NOTE: Who are you? The People from who they draw their authority, or a citizen who is a subject under their authority by consent? Assentio mentium - The meeting of minds, i.e. mutual assent. NOTE: Mutual consent. Assignatus utitur jure auctoris - An assignee is clothed with rights of his assignor. NOTE: Government has NO sovereignty of it's own. It is lent to them by the People. Bona fide - Sincere, in good faith. NOTE: "Is that contract Bona-fide?" Catalla reputantur inter minima in lege - Chattels are considered in law among the minor things. NOTE: AGAIN, Who are you? Chattel citizens, or one of the sovereign People? You can't be both! Consensu - Unanimously or, by general consent. Contra non valentem agere nulla currit praescriptio - No prescription runs against a person not able to act. Coram non judice - Before one who is not a judge. NOTE: The guys in the black dresses you see in court today for the most part are not Judges. They are equity court administrative trustees under maritime admiralty law. Real judges are elected, swear an oath of office to abide by the constitution, and are bonded. A commissioner is without a doubt NOT a judge! Corpus delicti - The body, i.e. the gist of crime. NOTE: The body of a crime. No crime has been committed unless injury, harm, fraud, or a violation of rights has been committed against another. The Corpus Delicti describes those injuries. In most civil matters, there is no Corpus Delicti whatsoever. Crimen omnia ex se nata vitiat - Crime vitiates every thing, which springs from it. NOTE: What is going on in our so called justice system today can only be described as fraud. Fraud IS a crime! People serving jail and prison sentences without Corpus Delicti IS a crime! Cujus est solum, ejus est usque ad coelam; et ad inferos - He who owns the soil owns it up to the sky; and to its depth. NOTE: If you hold a Deed to property, it may be surprising for you to know that you only own the property sitting on the land. Even your garden and lawn are owned by the State threw usufructory. You pay property taxes as rent on the land. De facto - In fact. NOTE: What is De facto? In fact, in deed, actually. This phrase is used to characterize an officer, a government, a past action, or a state of affairs which exists actually and must be accepted for all practical purposes, but which is illegal or illegitimate. In this sense it is the contrary of de jure, which means rightful. legitimate, just, or constitutional. Thus, an officer, king, or government de facto is one who is in actual possession of the office or supreme power, but by usurpation, or v.-ifiirespect to lawful title; while an officer, king, or governor de jure is one who has just claim and rightful title to the office or power, but who has never had plenary possession of the same, or is not now in actual possession. De jure - Rightful, by right. NOTE: Rightfully; lawfully; by legal title. Contrasted with de facto. Of right: distinguished with de gratia (by favor). By law: distinguished with de æquitate (by equity). A government de jure, but not de facto, is one deemed lawful, which has been supplanted; a government de jure and also de facto is one deemed lawful, which is present or established; a government de facto is one deemed unlawful, but which is present or established. Any established government, be it deemed lawful or not, is a government de facto. Delegata potestas non potest delegari - A delegated authority cannot be again delegated. NOTE: The US government, having been given it's authority by the People, to act under the constraints of the constitution, can NOT delegate away it's duties to other governmental establishments such as the United Nations. Derivativa potestas non potest esse major primitiva - The power which is derived cannot be greater than that from which it is derived. NOTE: The created, can not have ANY powers greater than it's creator. People created government. If the People did not possess a power or right, then they can NOT give it to their creation! Dominium - Ownership. NOTE: Dominion. Also see, Alodium, and usufruct. Ei incumbit probatio qui dicit, non qui negat - The burden of the proof lies upon him who affirms, not he who denies. NOTE: Innocent until proven guilty. Or is that the other way around these days? Error, qui non resistitur approbatur - An error not resisted is approved. NOTE: You must first learn your rights and who you are in status before you can do this properly. Every assumption then made as to your standing can be rebutted successfully, and must be done immediately or it will stand in law for a given case. Facultas probationum non est angustanda - The right of offering proof is not to be narrowed. NOTE: You can NOT be denied use of evidence weather it be case law, or simple photographs of an area where some supposid violation of private code allegedly took place. This happens a lot! Fictio cedit veritati; fictio juris non est, ubi veritas - Fiction yields to truth. Where truth is, fiction of law does not exist. In fictione legis aequitas existit - A legal fiction is consistent with equity. NOTE: Where do we go to court these days? Courts of equity. Essentially bankers courts unless the charge is in fact a legitimate criminal charge. You represent the legal fiction (surety) in these courts. Invito beneficium non datur - A benefit is not conferred upon one against his consent. NOTE: If you are a US (corporation) citizen, then you have unwittingly traded in your rights in exchange for government benefits and privileges (civil rights). Nemo plus juris transferre ad alium potest quam ipse habet - No one can transfer to another a larger right than he himself has. NOTE: The creator can NOT give his creation (government) something that he himself does not possess ie the right to violate others rights, etc. Nemo potest facere per alium, quod per se non potest - No one can do through another what he cannot do himself. NOTE: You can not delegate powers you yourself do not possess to another to act on your behalf. Nemo tenetur armare adversarium contra se - No one is bound to arm his adversary against himself. NOTE: You have the right to remain silent. ANYTHING you say will be used against you in a court of equity. And anything you provide them with such as proof of adhesion contract will also be used against you. You really need to learn what you can say and what you should not say or do. Just shutting up gives them consent and makes their assumptions law, so you can NOT just shut up. Learn what your rights really are, and where they really come from. Not what you have been told they are in STATE Run School. Then you will know what to say to every question, false assertion, and how to rebut every assumption they are trying to put over on you. Qui tacet consentire videtur - He who is silent appears to consent. Vigilantibus non dormientibus jura subveniunt - The laws serve the vigilant, not those who sleep. Volenti non fit injuria - An injury is not done to one consenting to it. Links to important definitions, articles, and case law. A Treatise On Arrests And False Imprisonment. JURISDICTIONAL CHALLENGE OF ANY COURT, ANYWHERE! Just whom may take advantage of constitutionally protected rights in their own defense? License and Registration, the conversion of natural unaleinable individual rights into micromanaged, monitored mere privileges. Police & Sheriffs are now pre crime units for the Federal corporation mandated war against American citizens. The DMV scam: How your right to travel has been converted into a mere privilege. The People are not bound by statute! The validity of the public debt shall not be questioned. What manner of PERSON are you? What you should do when pulled over by a revenue collector with a badge! How to talk to a badge because silence is consent. Why do People get shot down in the State's Courts, but always win on APPEAL?